Buy More! Get Your Reward Now! HomeBuy More! Get Your Reward Now! “Purchase just $12.99 more and receive your free reward!” my online shopping cart informed me. I looked at my cart, it contained what I needed, nothing more. But the lure of something free waved like a red flag in front of a bull. I found something else that I’d probably need in the future, and added it to my cart. A new message popped up. My body pinged with excitement. Something free! Yippie! I moved the mouse toward the checkout button, and another message popped up. Oh, boy. The cleaning caddy would look wonderful on my bathroom sink. I clicked to their sale page. Maybe I could find some gifts for other people. I like to have gifts on hand, just in case I need a hostess gift or something unexpected comes up. Before I knew it, my cart had the requisite dollar amount and my friendly shopping cart informed me that I’d gotten my reward. I looked at the total and cringed. When I started my shopping experience, I had three specific items in mind—and together they cost $15. Instead of clicking the buy now button, I went to my cart and removed everything but the three items I really needed. Immense satisfaction warred with bargain hunter’s regret as I saw my rewards disappear. I checked out before I could change my mind—the reward of living with less hovered over my shoulder, affirming that I’d made the right choice. Face it. We all love to receive a reward. Advertisers and marketers offer rewards all the time—and we fall prey to buying more to receive something of value. Even if the value doesn’t justify spending more. For too many years I’ve fallen for false rewards—buying more than I need in order to receive an incentive. I have a box of Creative Memories scrapbooking supplies to prove it. But as I grow closer to Jesus, I find it easier to just say no. No to false promises that achieving shopping rewards will make me feel fulfilled. Passing up on sales and promotions that only entice me to spend more. Bypassing bargains for things I don’t really need. Cutting down on clutter by giving away and repurposing instead of buying more. The only reward that really matters is inclusion in God’s kingdom. If I trip myself up on thinking I need rewards here on earth, I might miss out on the bigger reward awaiting me. What about you? Do you struggle with incentives and rewards that flash and blink? Those free rewards can so easily pull us in. I’m just as guilty. Yes the only reward that matters is inclusion in Gods kingdom. We aren’t always good at including all Gods people though. Im glad God sets a much better example. I know I can definitely do better at including everyone! Learning a little behind the psychology of advertising sure helps me resist! What a great post! I am finding that I like living with less. It wasn’t always that way though! Those 30% off coupons got me every time! Things can take our eyes off the most important reward can’t they! 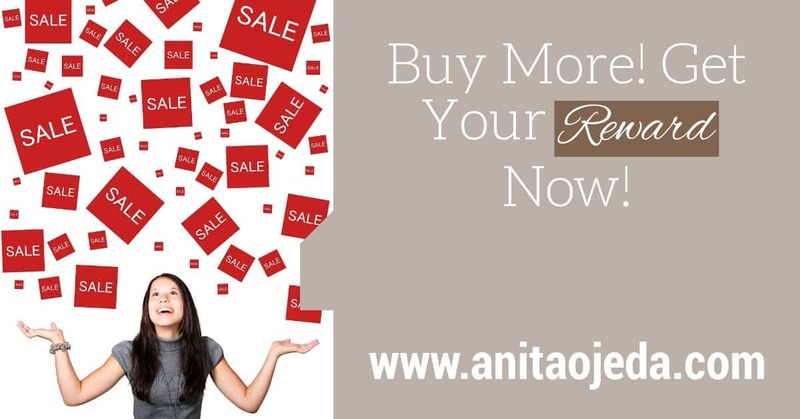 This is such a great reminder Anita! There’s something about aging that helps us realize we don’t. need. so. much. stuff! Yippie! Good for you–escaping Costco with only the items you went in for is a huge accomplishment! Your post reminded me of the Casting Crowns song, “Only Jesus.” Thank you for this encouraging reminder to focus on eternal rewards. I’ll have to find that song and listen to it! I love Casting Crowns :).